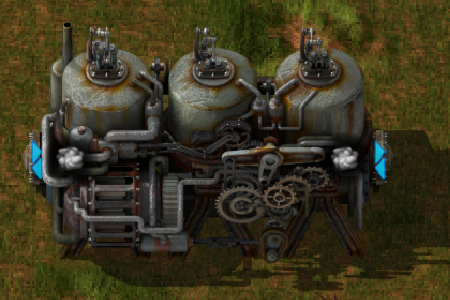 Steam engines are the most basic electricity generator, available to the player at the start of the game. They produce electricity by consuming steam, using water pumped from an offshore pump that was heated to 165°C steam with boilers or to 500°C steam with heat exchangers. Steam that has a higher temperature than the maximum temperature of the steam engine (165°C) is consumed at the normal rate (30 units/s), and does not yield more electricity. This means the energy that was put into the steam to heat it to a higher temperature is wasted. Steam engines will automatically adjust their power production and steam usage based on the current demands of the electricity network. Hovering the mouse over a steam engine will display their current power production (Performance) and their possible power production (Available Performance), in a display on the right. Steam engines have two ports, allowing excess steam to flow through. This allows steam engines to be chained together. The current optimal ratio is 1 offshore pump to 20 boilers to 40 steam engines. Using steam engines for power does not produce pollution, unless boilers are used to heat up the water. Steam is now internally a separate fluid from hot water. Added high graphics quality option for the steam engine. Increased the maximum power production of the steam engine from 510kW to 900kW. Doubled the heat capacity of water from 0.1kJ per degree per liter to 0.2kJ. Change fluidbox height and base level of boiler, steam engine and pump to improve fluid flow. This page was last edited on 7 February 2018, at 10:01.